Chicago can be an expensive city to visit ($5,000 “Hamilton” tickets, anyone? ), but it doesn’t have to be. Without spending a dime, you and the kids can see gorillas, world-renowned art and architecture, and even learn how to dance. So spend some time doing things from my list below, and save your money for things like deep dish pizza or Chicago Cubs tickets. Sometimes free equals lame. Not these activities. As a Chicago mom who needs to watch her spending, I’ve tested out all of these activities. They’re all things my kids have enjoyed, and things I’d recommend to any parent visiting Chicago. 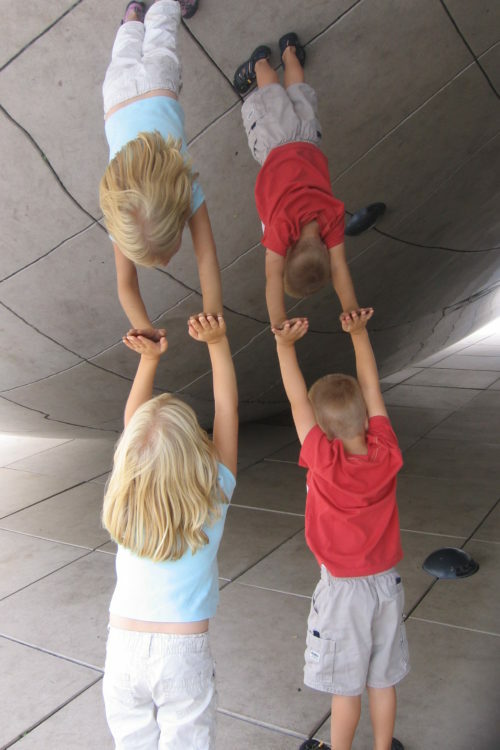 Photo by Jamie Bartosch/Suburban TravelingMom Take fun photos at The Bean in Millennium Park. Downtown’s premiere park is very family-friendly. Start by taking cool photos of your reflection at “The Bean,” the giant mirrored sculpture that is the most famous feature of Millennium Park. Then walk over to the adjacent Crown Foundation, with water-spewing video towers of people’s faces. The area is surrounded by bench seating, so you get a break while your kids splash around and get ridiculously wet. Dry off with a walk through Lurie Garden (free guided tours are available on certain days), and then plunk down on the lawn at the architecturally-stunning Jay Pritzker Pavilion, which is always hosting some type of free music or theater performance. If the kids still have energy, go to the adjacent Maggie Daley Park. There’s a huge play area and a climbing wall (advanced reservations required). 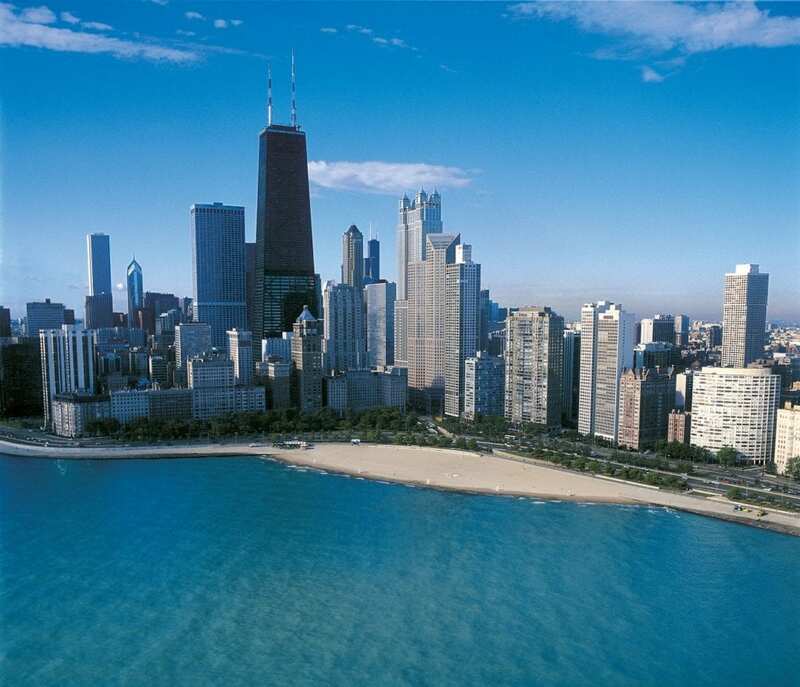 Chicago’s lakefront path has gorgeous skyline views. This is my favorite place in Chicago. 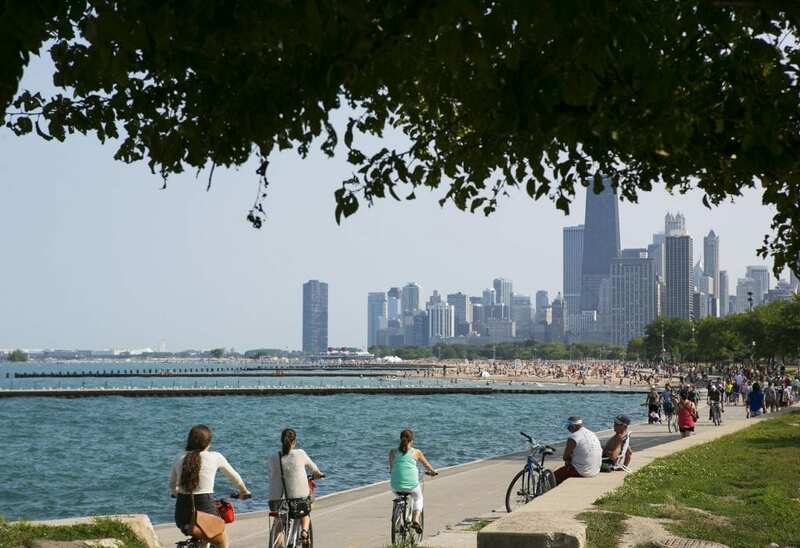 Walk, jog, bike or rollerblade along the gorgeous 18-mile-long lakefront path, with skyscrapers on one side and Lake Michigan on the other. Fun things to do along the way include watching the beach volleyball players (at North Ave.), the dog beach at Montrose Avenue, and Lincoln Park Zoo at Fullerton Avenue. Plus, you’ll cruise past iconic downtown sites like Buckingham Fountain, Navy Pier, Adler Planetarium and Soldier Field. Dig your toes in the sand at any number of beaches – you can go in the water, but it’s coooooold. You might want to just sit on the rocks and soak up beautiful skyline views. This is on every “Free in Chicago” list you’ll ever read, and for good reason. Admission to this excellent, lakefront zoo is free. Our faves? The gorillas and chimpanzees at the Regenstein Center for African Apes, and the polar bear and penguins exhibits. 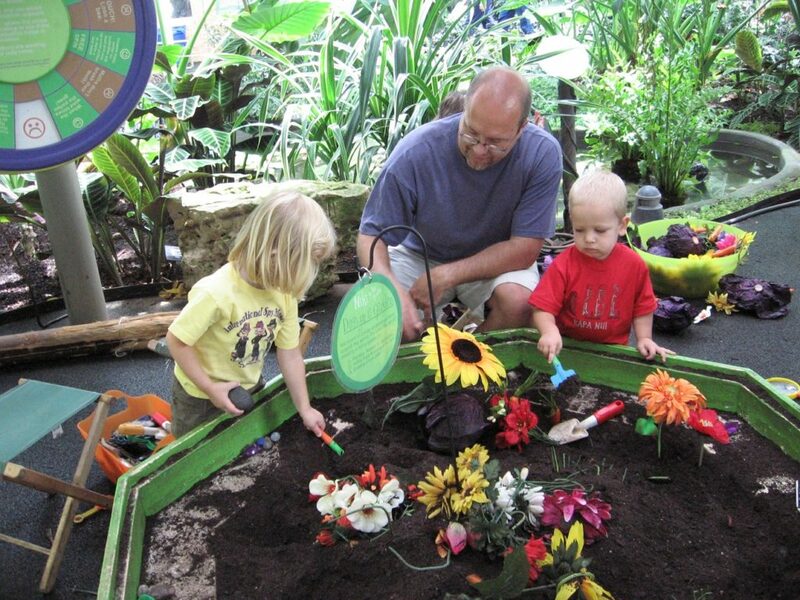 The Garfield Park Conservatory is a hidden gem and a free family activity. This hidden gem is on the city’s West Side. The neighborhood is not great, but the conservatory is. It has meandering trails and greenhouses filled with tropical plants, cacti, good-smelling plants, and a children’s play garden that encourages climbing. Just down the street is Inspiration Kitchen, a wonderful place to eat a meal – the restaurant provides job training for the homeless, poor, and former prison inmates. Fellow Chicago mom Megy Karydes did a nice video about the conservatory and restaurant. And TravelingMom with Babies Jackie Gibson loved the conservatory for little ones. The city of Chicago offers free neighborhood tours, done by local residents. 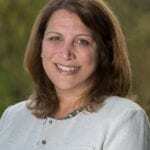 Learn from a local! 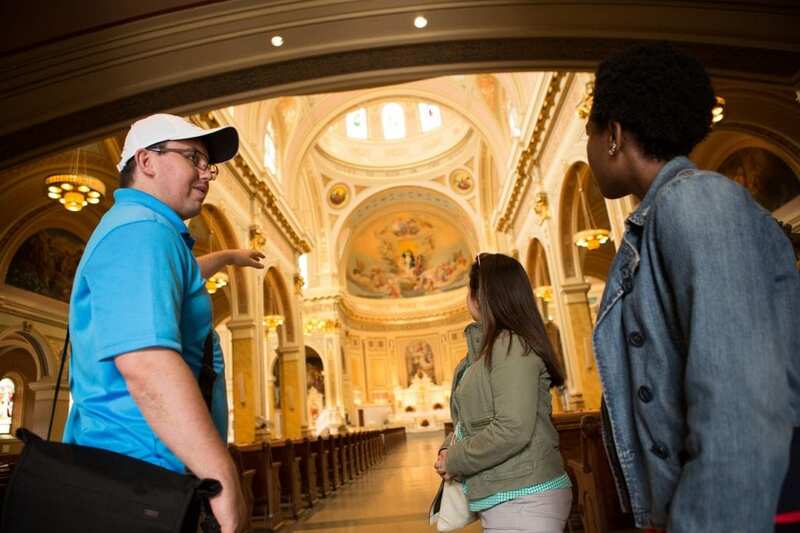 Take one of the free neighborhood walking tours from City Greeters. You can choose from 24 different tours. You can sample ethnic foods in Chinatown, see the party atmosphere around Wrigley Field, or just learn about cool stuff downtown. 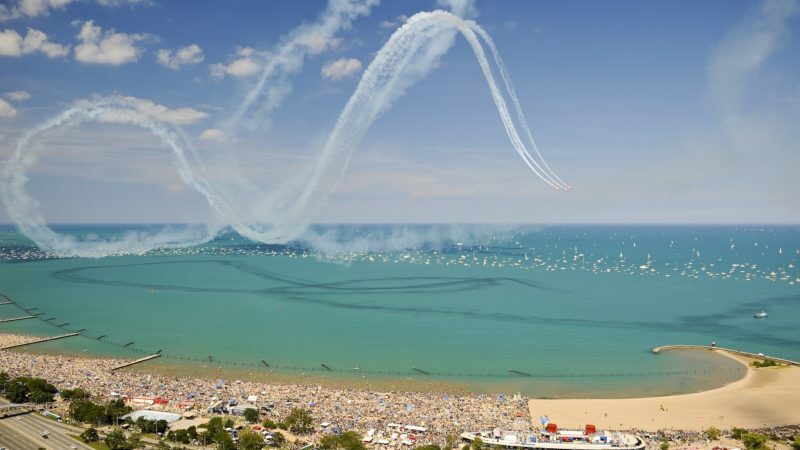 Chicago’s Air & Water Show draws huge crowds to the lakefront. Kids love this show, held one weekend each year in August (in 2016, it’s Aug. 20-21). 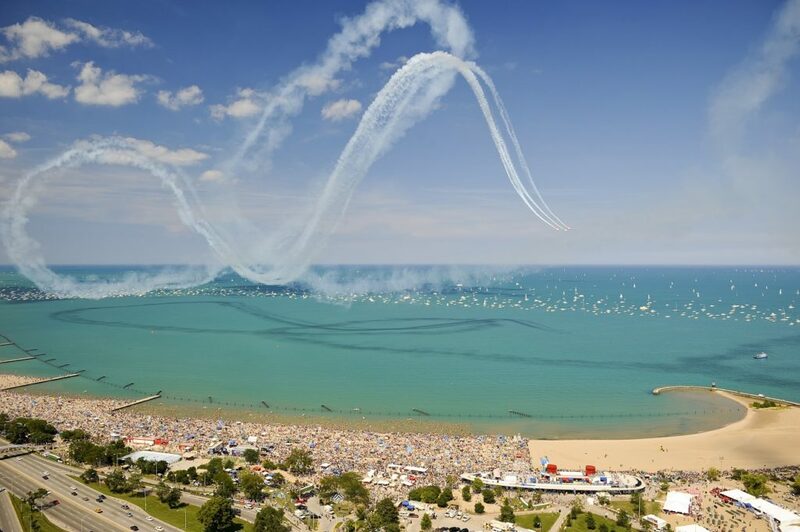 This spectacular show will make you oooh and aaaah, as antique ships float past, and the skies over Lake Michigan are filled with fighter jets, Blue Angels and stunt planes. The beaches will be crowded, but the kids will be wowed. A new, short (2.7 miles) paved bike and walking path runs through some of Chicago’s hippest neighborhoods. That means that after you ride, you’ll find some great restaurants. Some of my favorites are Miko’s Italian Ice, Roeser’s Bakery, 90 Miles Cuban Café, and El Nuevo Borinquen (Puerto Rican food). Divvy bikes are available for rent at each end of the path. 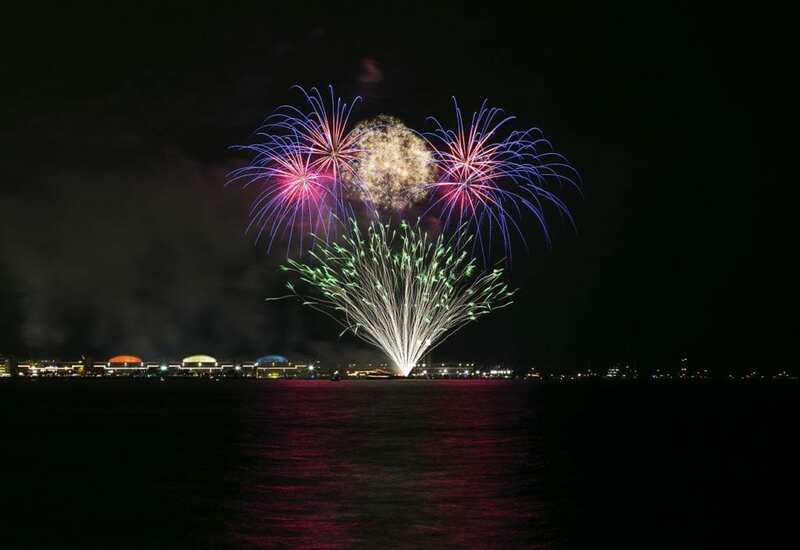 A fireworks show is held two nights at week at Navy Pier. Navy Pier is one of the most popular tourist attractions in the state of Illinois, and it can make for an expensive day. So you will want to take advantage of the free things to do. That includes an impressive fireworks show over Lake Michigan. The shows happen twice a week, at 9:30 p.m. Wednesdays and 10:15 p.m. Saturdays, through Labor Day. The bombs bursting in air are synchronized to music. You can hear the music while standing along the waterfront at Navy Pier. Almost every Chicago museum has certain days where admission is free, so check the websites. 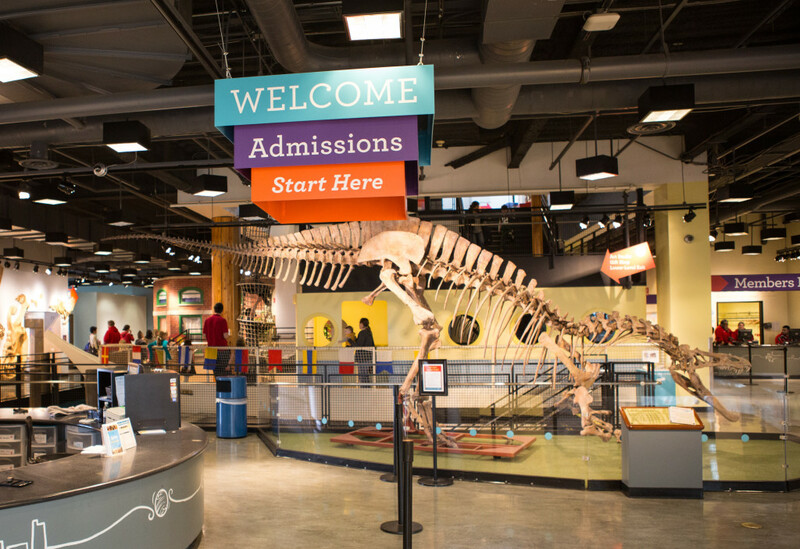 Among the options, Chicago Children’s Museum is free from 5-8 p.m. Thursdays, and kids 14 and under are always free at The Art Institute (although adults must pay). The Bahai Temple is surrounded by gardens and across the street from a great Lake Michigan beach. 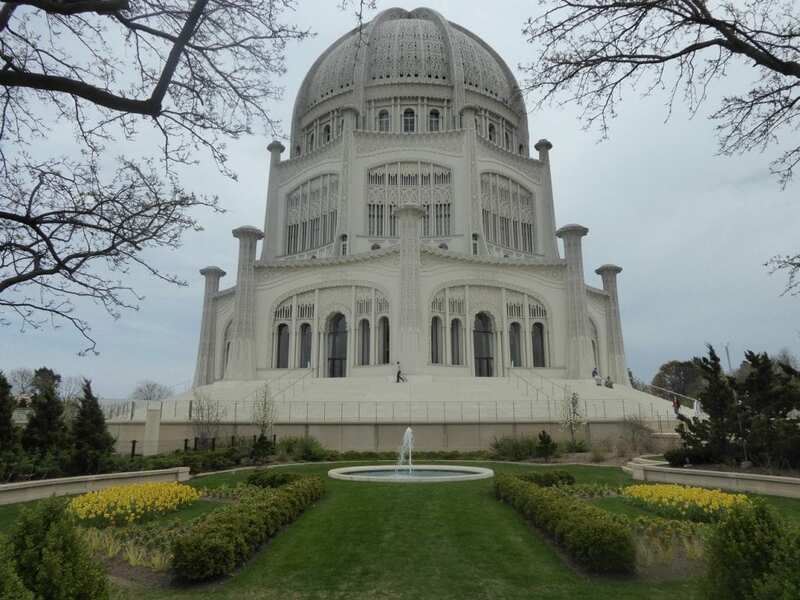 Take the Purple Line L train till it ends at Linden Avenue in north suburban Wilmette, and you’ll be walking distance to this magnificent temple and gardens. Visit the welcome center to learn about the small but fascinating religion that views all religions as one, and maybe attend a service or music performance. The domed sanctuary is for silent meditation and prayer. Across the street is Wilmette’s Gillson Park and Harbor, which has a terrific beach (there’s a fee to enter the beach here, however). 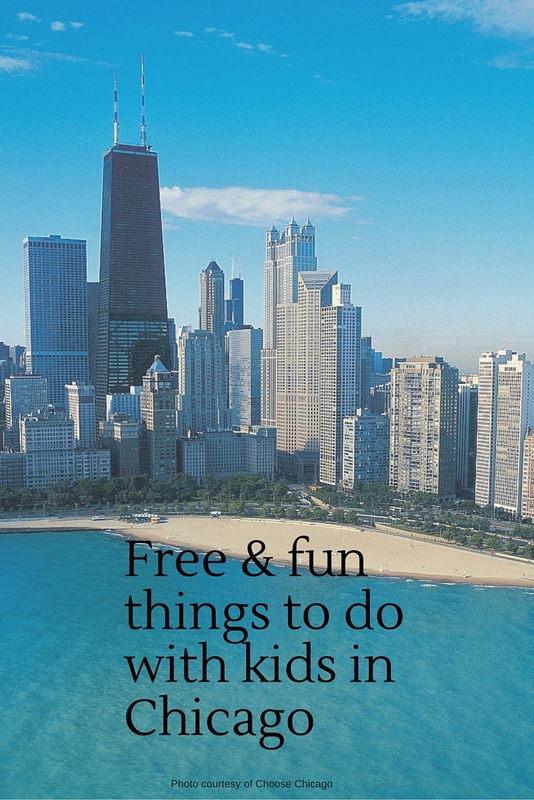 Chicago is a magical city with lots of fun, free things to do with kids. I believe I’d follow all those good tips eve without the kids — grandkids in my case. Thanks.